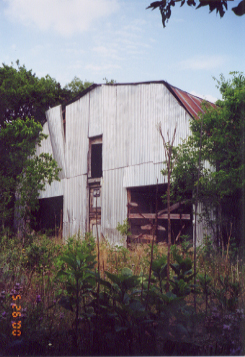 This is a barn located near the back of the property. This barn was used to store hay and housed small ponies (among other things). This is the only part of the zoo visible from inside Walnut Creek Park. The photo was taken looking east -- at the back of the barn. 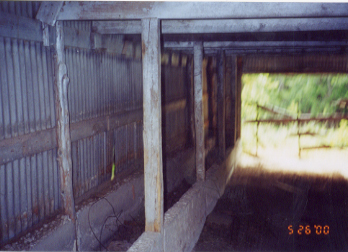 This is a view of the inside of the zoo barn. This photo was taken facing west -- toward the front of the barn. 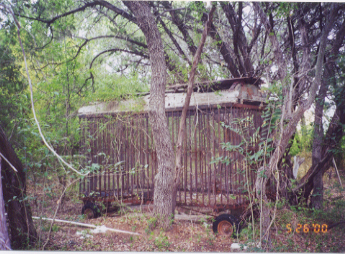 This is a cage-enclosed wagon. The owner's wife, Doris Cox, says that it probably came from a traveling circus or animal collector. This is a view of a line of cages. 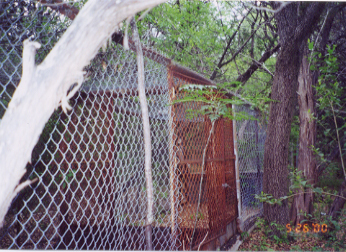 These may be the cages used to house two lions and some alligators.